National Schizencephaly Day, and A Winner! Today is officially National Schizencephaly Day! Parents, friends, and family members have been raising awareness for Schizencephaly on May 19th for a few years now, and have been trying to get it recognized in each state individually. Today, a senator from North Dakota brought the resolution to the U.S. Senate to passed as an official day in all states! We are so happy! My family spent the day wear purple & green, and handing out little business cards with a few facts about Schizencephaly on them, and a purple or green lollipop attached. Miss A really enjoyed passing around her cards to the special people in her life. The winner is comment #9! Liz, of The Whispering Seas, that’s you! Check your e-mail, so I can get your earrings to you! 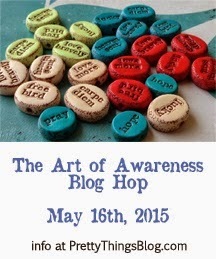 Art of Awareness Blog Hop Reveal Day! I am so excited to share my pieces and story with you all! Lori Anderson teamed up with Heather from Swoondimples to create this blog hop and I am so excited about it. Let’s get right to it, shall we? I chose 2 beads, since I wasn’t sure if Heather would be able to make the bean beads in multiple colors. Which means I got to make twice the pieces. I chose the colors purple and green, which on their own stand for many, many disorders, diseases, cancers, illnesses, etc. But put them together? And you get the two colors for a disorder called Schizencephaly. Most people don’t know what Schizencephaly is—I didn’t until late August of 2011. And that’s because it is an extremely rare congenital brain malformation which effects an estimated 1 in 100,000 people. Which means that currently there are only about 7,000 people living with Schizencephaly in the entire world. Research is still being done as to its cause, but most doctors believe that it has a couple of causes—one being genetic, and one being that the baby suffered a stroke of some sort in the early stages of pregnancy. Schizencephaly causes there to be slits (or clefts) in either one or both hemispheres of the brain. This causes a host of other symptoms, including epilepsy (most people having multiple seizures a day), poor muscle tone, speech delays, cerebral palsy, and much, much more. In late August of 2011 my parents (who are foster/adoptive parents) received a call from a case worker for a new placement—a newborn little girl. As usual, my parents said yes, no questions asked. They soon found out that Miss A had been diagnosed at birth with Bilateral Schizencephaly. Of course we hit the internet to find out all about it, and were hit with road blocks because there isn’t much out there. We were able to find out that the bilateral part meant that she had these clefts on both hemispheres of her brain. My parents were told of all the possible problems Miss A could face in her lifetime, and my family took off on our journey with Schizencephaly. We’re currently working on a website to share her story, but there isn’t much there. But feel free to check it out, as there will be more this weekend since May 19th (Tuesday) is Schizencephaly Awareness Day. You can check it out here: AIM for Schizencephaly Awareness. My first piece is a bracelet featuring my purple bean bead that says “aim”. I chose the word aim for a few reasons-the main one being that they are Miss A’s initials. (cool, huh?) The second is so that I can remind myself to always aim for awareness, our goal, any goal, just as Miss A does. She never gives up even though many things are extremely difficult for her. The bean bead features that cool awareness ribbon stamp on the back, and the bracelet is just simply strung with some small silver ball spaces, and purple and green dyed jade rondelles. My next piece I haven’t decided if I’m going to put in on a chain, key ring, or use it around the house a decoration, so I left it like this until I decide. It features a green bean bead this time, with the word “joyful”, as a reminder of how full of joy Miss A always is. She never lets anything get her down, and is something I’ve learned that I need to work on myself. She is always so full of giggles, smiles, laughs, and happiness. I surrounded it with 2 vintage Swarovski crystals and topped with a gorgeous amethyst rondelle. Lastly, I made a pair of simple earrings. These are just simple dangles of dyed green jade teardrops and gorgeous dark purple amethyst rondelles on sterling silver ear wires. These earrings can be yours for the low price of a comment on this post, and the help of a random number generator on Tuesday.Winner will be announced between 11:00 PM and Midnight Tuesday night, May 19th. Thanks for stopping by to learn about Schizencephaly, and my favorite little girl, Miss A. To see the list of participants in this hop, please check out the page over at Pretty Things Blog. And here my beans are with their new beady friends that may be joining them on their journey to become a piece of jewelry. Check back on May 16th for the reveal of what I’ve created with my bean beads, and for the story of why I chose those colors and those words. Also, there may be a small giveaway! You can click here to see a full list of participants! Hi! I'm Paige. I'm a 30-something from rural Maine who loves to create. Beads are my favorite, so I make a lot of jewelry. I come from a large family (as in, there are 10 kids), and they are a huge part of my life. I love hanging out with my youngest siblings, and the inspire me everyday.